I am continuing to enjoy Mummy’s week off. Even the weather is behaving itself which helps our fun days out. Yesterday, Mummy gave me a map and told me to go talk to Ted and decide where we’d like to go. I closed my eyes and pointed at the map a few times but I kept landing in the middle of the sea and Mummy doesn’t really like boats so she said no 🙁 Ted was a bit more practical, he borrowed the iPad and looked up outdoor places to go around Dublin. 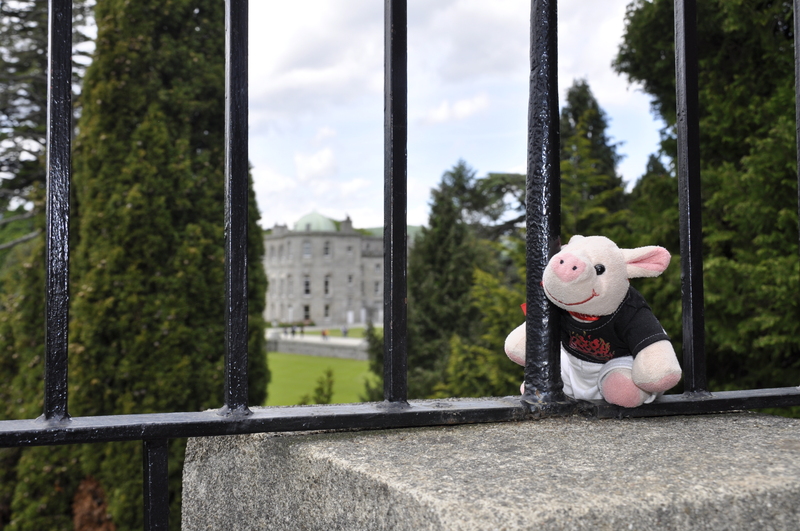 We decided on Powerscourt House in Co. Wicklow which has huge gardens to play in. Off we went! 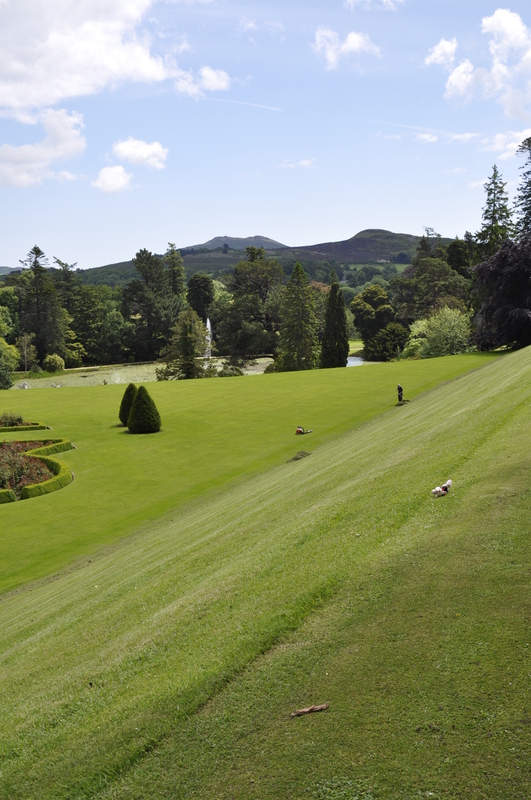 The gardens are brilliant. There was a map that we followed and it brought us to all the best spots to play in. First, there was a tower! I love towers 🙂 I climbed all the way to the top (well, Mummy did, I got carried). The view was pretty good but the main reason I wanted to go up there was to throw water balloons at people. I didn’t get to though, Ted had confiscated them and taken the water out. You’ll notice through the rest of this blog that every time I find something fun to do, Ted spoils it……. Here’s me on top of the tower. Note the absence of water balloons. 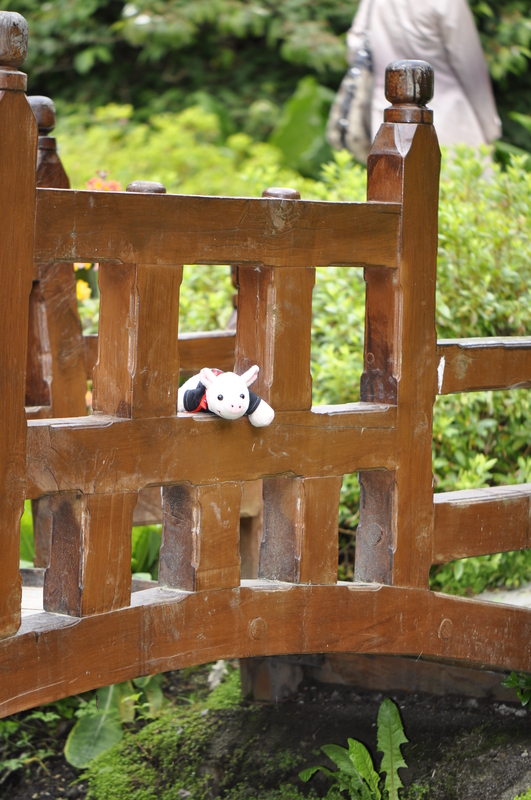 Next we went to the Japanese gardens section. I liked it there because most of the things were my size. 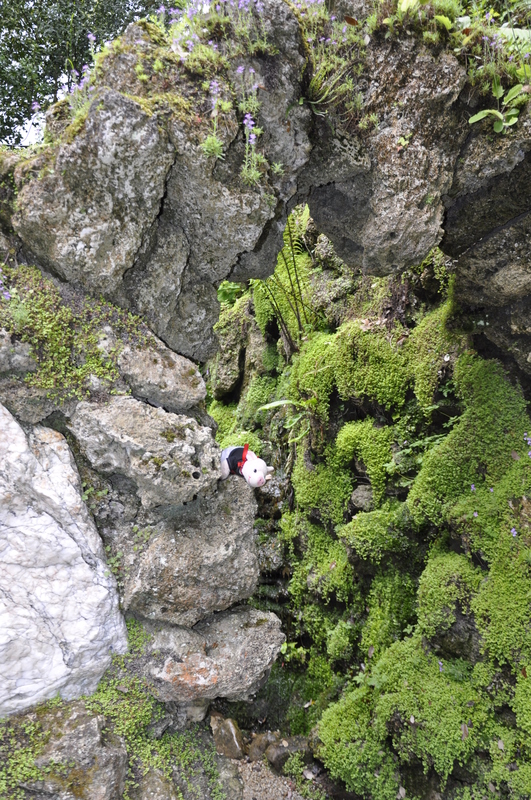 The bridges were small and all the little statues were great for climbing. Mummy was taking pictures of flowers again so we had time to play hide and seek and chase butterflies. Here’s me on one of the bridges. I was trying to work out whether it would be possible to push Ted in without Mummy noticing (he was being a bit of a pain). 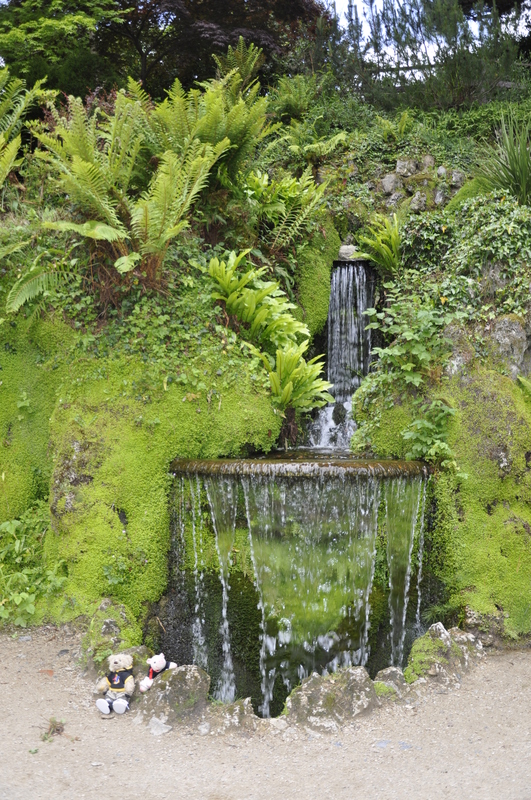 After that, we went a little bit further and found a really cool waterfall. Mummy made us stand still for ages to get a nice picture of us beside it. She wants a nice picture to put on the fireplace where I don’t look bold and Ted doesn’t look like he’s trying to make me behave. Good luck Mummy! We went on a long walk after that, we went up and down hills so I had to be carried (I needed to keep some energy for later). We passed a really creepy place, the pet graveyard. I didn’t really like that but we went past pretty quickly. Mummy said there are dogs, ponies and all sorts of other animals buried there, even a cow! Very strange. We had to stop a lot to let Mummy take pictures of boring stuff like trees (only fun for climbing and dropping things from) and flowers (only fun when you put sneezing powder in them and ask someone to sniff them). 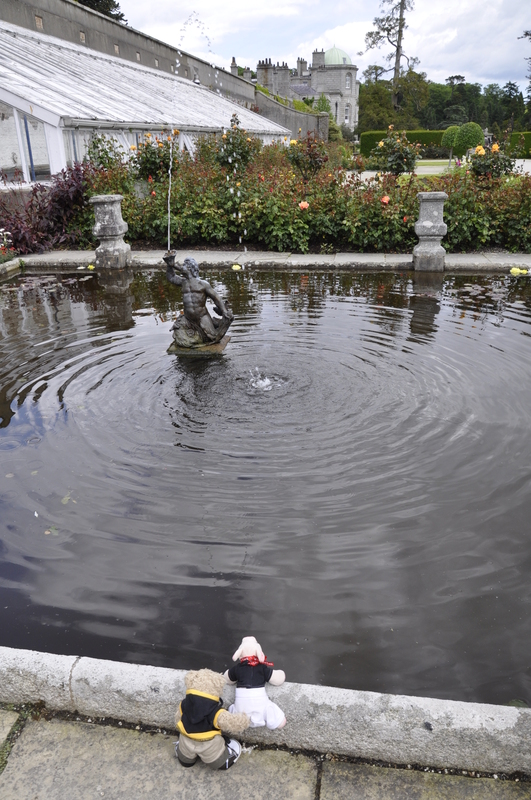 Eventually we got to a little pond. I was trying to see if there were any fish in it that I can catch. The pond in my grandparents house has fish in it. But Ted tried to push me in!!!! And did my Mummy try to help me? No! She just took a picture of it instead. Not amused! Nobody was any fun. The next thing I tried was trying to roll a big stone ball off it’s base. I thought it might be funny to see the ball rolling down the hill and hitting things. 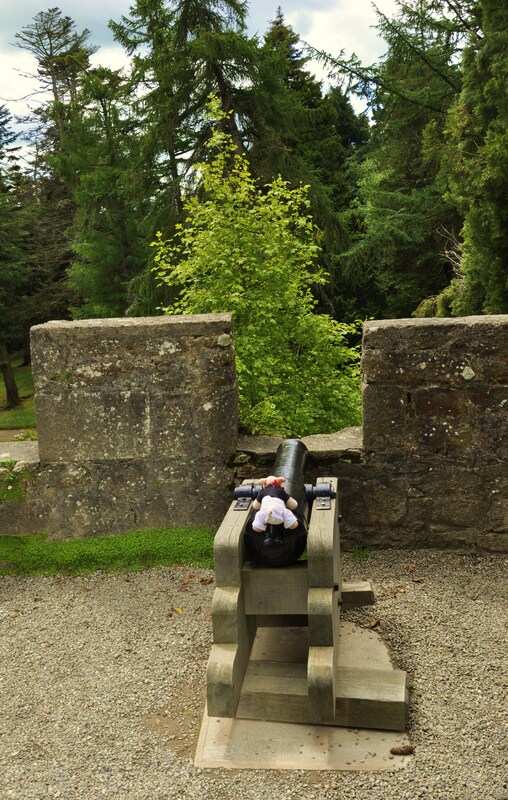 I was also considering whether I could roll it back to the cannon to use as ammunition. 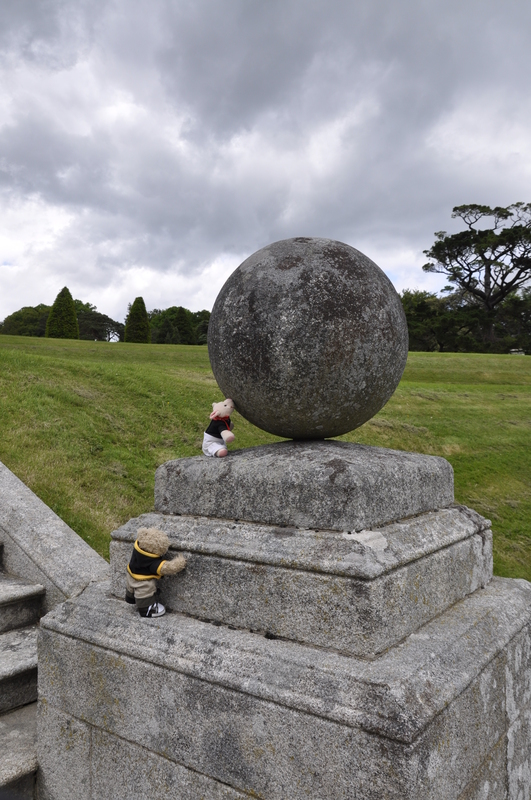 My plan was foiled again, Ted caught me and pulled me back down before I managed to get the ball to move. When I went a bit further down towards the lake, I found something that may provide the solution to all my future transportation problems. Flying horses! I’d never seen one before but they look really cool. I think I’d look pretty cool flying along on one at the head of my army. I wasn’t able to climb up on one because they were behind a fence and I would have needed a ladder anyway because they’re very big. 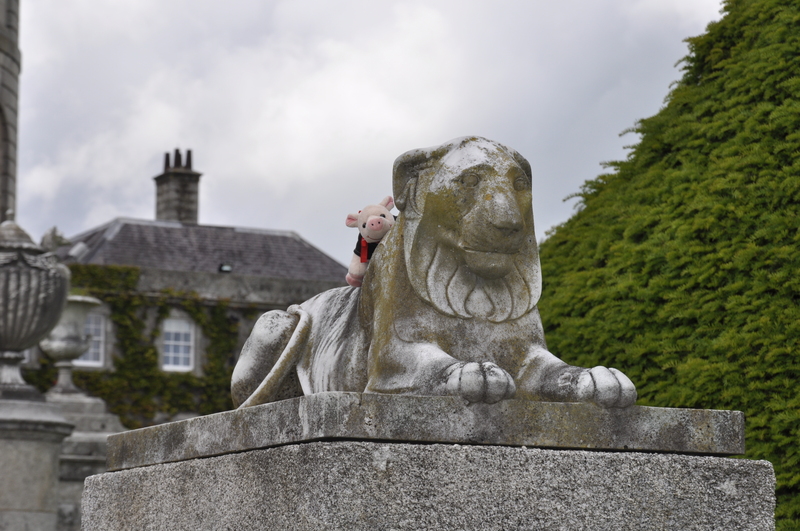 So I had to make do with a stone lion instead. I still think I look pretty awesome sitting on top of it. After that, we went for cake to get our energy back and then on to a really cool doll museum. My next post will be about that. I’m off to get some lunch and then pester Mummy to bring me more places, talk to you later! 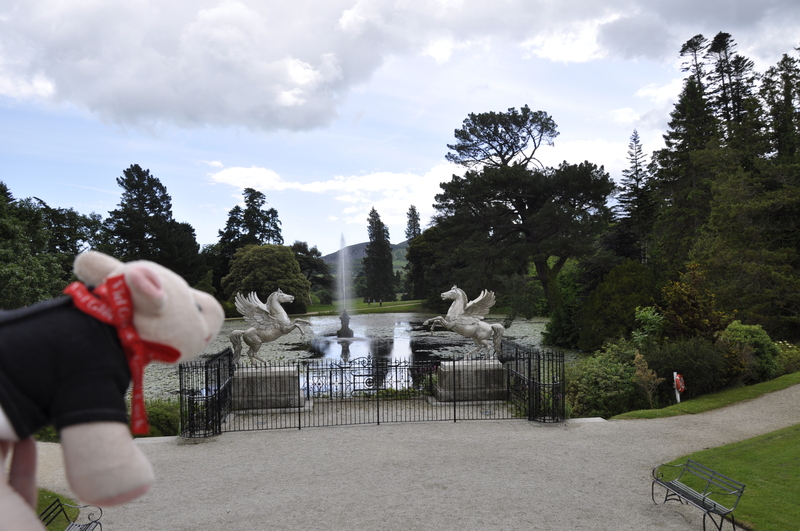 This entry was posted in Uncategorized and tagged Powerscourt House and Gardens, Wicklow. Bookmark the permalink.